Many of the Vriesias have plain, light-green leaves, but Vriesia guttata is an outstanding exception to the rule, for its green leaves are densely stippled with deep purple-maroon spots. The inflorescence, which develops in late summer, is an imbricated bract of soft lavender, out of which the yellow flowers protrude, at intervals, over a period of several weeks. Also shown on the same branch are a couple of strands of the ubiquitous "Spanish Moss", Tillandsia usneoides, which has the widest distribution of any bromeliad, extending from Virginia to Argentina. "FLORA OF GUATEMALA", by Paul C. Standley and Julian A. Steyermark, which is a contribution of Fieldiana, Botany, Vol. 24, Part I, published by the Chicago Natural History Museum, has recently come off the press. 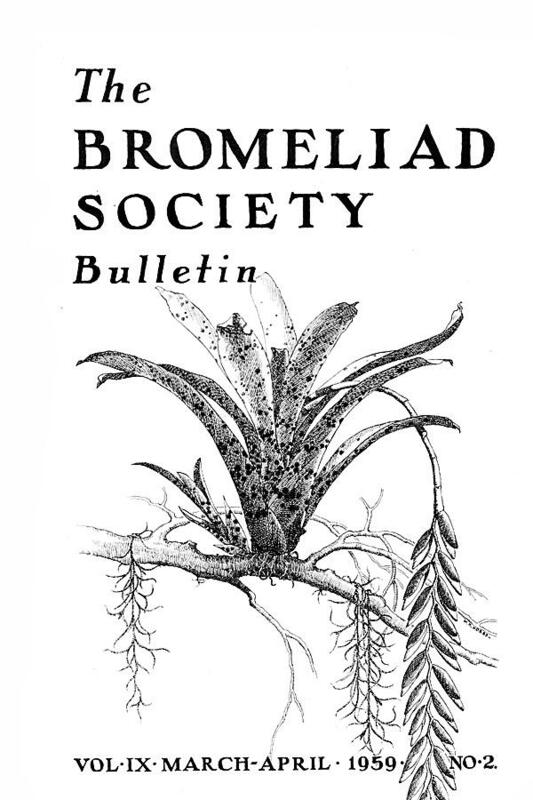 Ninety-five pages of this 476 page volume are devoted to the bromeliad section which has been prepared by Dr. Lyman B. Smith and it is liberally illustrated with his drawings. The Publications Office of the Chicago Natural History Museum, Chicago, Illinois, is selling reprints of this treatment of the "Bromeliaceae of Guatemala" at $1.50 postpaid. More and more botanical collectors in the field are taking specimens of bromeliads, often of such shape and size that they have, previously, been frequently avoided. Thus, there now come to the able hands of Dr. Lyman B. Smith more new bromeliads to be described. His first publication in the new year is the January, 1959, PHYTOLOGIA (Vol. 6, No. 8) which contains Dr. Smith's "Notes on Bromeliaceae" XI, in which are described fifteen new species, one new combination, and one new variety, from several countries. The Society has for sale a limited number of copies of Mr. Walter Richter's delightful little picture book, "Seltsame Bluten Aus Urwald und Steppe", (Some Flowers from Forest and Plain). The book, although tiny, (4¼" × 6") contains sixteen striking pictures in brilliant color of outstanding bromeliads, and is, indeed, a collector's item. To obtain a copy, send $1.30 to the Secretary, 647 South Saltair Ave., Los Angeles 49, California. Mr. Richter is not only a world authority on bromeliads, but is a writer of great interest and a photographer of rare talent. His latest book, "Die Schonsten Aber Sind–Orchideen", contains some of the most beautiful colored photos of orchids ever to appear in print. Plans are going forward to publish a second edition of the Handbook. It is hoped that by late spring there will be enough paper-back copies to fill the ever-increasing demand for this valuable little book. We have been saddened by news of the passing of Col. M. T. Boscawen in London last November. He was our East African member whose collection and garden were described by Dr. Frank Piers in the July-August, 1954 Bulletin (Vol. IV, No. 4). Aided by a favorable climate and a very active interest in horticulture, Col. Boscawen established an outstanding collection of bromeliads and other rare plants in the midst of his Tanganyika sisal estate. Oases of bromeliads, like this, dotted around the world, make warm friends with mutual interests even though we never have personal contact with them. Col. Boscawen had planned to come to America sometime for a visit to the Bromelario in Orlando, Florida. It is deeply regretted that this plan could not be realized. 2 Tillandsia bulbosa, and at the left, 1 Tillandsia capitata. Bromeliads make an ideal medium for interior plant arrangements. The color and symmetry of their shapely rosettes; the style and variety of their form and silhouette challenge the imagination of both plant grower and artist. Clever and graceful arrangements have been made of bromeliads placed on branches and trees, on bark or cork-covered metal pipes that resemble trees, and on assemblies of bark and cork slabs. Illustrations and descriptions of such artistic work with bromeliads have appeared from time to time in the "Bulletin," and have further stimulated efforts to combine the beauty and the usefulness of these plants in outstanding interior arrangements. The term applied to such collections of bromeliads mounted on dead branches, regardless of size, is "Bromeliad Tree." The prototypes were very large tree-like branches, or sometimes entire trees, that were decorated, with bromeliads and served as displays in flower shows, conservatories, or good-sized interior planting areas and alcoves. Large branches were firmly placed in the ground, and, when effectively decorated with bromeliads, these "trees" became focal points of interest. (Incidentally, because of the epiphytic nature of the plants, they were frequently mistaken for orchids, especially when in spike, and were often called parasites.) Beautiful as these large trees were, however, the typical bromeliad grower could not be their proud possessor. They took up too much space, and watering the numerous plants was no small problem. With these limitations in mind, we experimented with smaller trees, and, in doing so, developed an assortment of new forms that still retained the designation: bromeliad tree. The driftwood is a soft pink to blend with the colors of pink and red with which the plants of Nidularium kermesianum and the Vriesia hybrids are suffused. 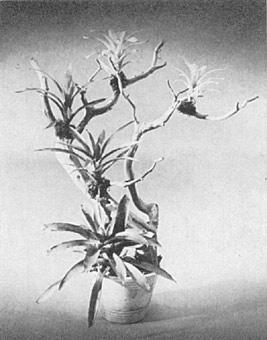 Mostly Tillandsia lindenii in an example of balanced asymmetry. The smaller bromeliad trees are most useful and practical as house plants. Their beauty and novelty "steal the show." Watering is no longer a major problem, for these light trees can be taken with ease to the kitchen sink or laundry tray, where the moss balls about the roots can be saturated and the rosettes filled. The trees are then left to drip-dry before being returned to their place of honor. A "living mural" of Vriesia splendens. The driftwood is the color of the dark striping of the plants. However, have nothing to do with these bromeliad trees unless you love both artistry and bromeliads, for you must be willing to go through the watering routine every two or three days. The extent to which you will be rewarded for this form of slavery is in your heart and soul, and also in your ears, unless you remain deaf to the audible admiration of your friends. When we began to develop these smaller "trees", we erred in two ways. First, we impatiently stuck them in plaster of paris to anchor them in containers, only to discover that plaster of paris disintegrated with moisture. We should have used a concrete mixture, and waited until the next day to affix the plants. Second, we were not selective enough either as to the shape of the driftwood or as to its relationship with the container. We had to learn to use critical judgment and to adhere to the rules of design in order to achieve an art form of balanced asymmetry with the driftwood and its container – a combination giving a pleasing effect even without plants. Then, with the addition of the plants, we had a creation that truly delighted the eye. 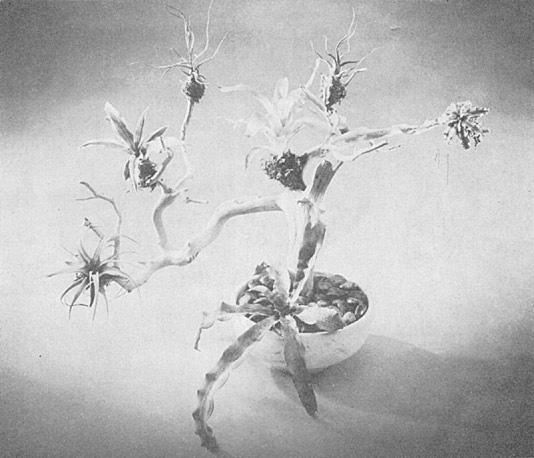 The arrangement of the plants became a study. We used mostly odd, and not even, numbers of plants. Beginning with the lowest bromeliad planted in the container, we sought to place them so as to form an ascending design in a curve or curves. Also, the plants were sized, the largest at the bottom to give the base weight. This effect is also attained by arrangement, the darker the foliage, the lower the plant. How arty can one get! In some bromeliad trees we used but one species, all the same size, such as Vriesia carinata. A few months after one such tree was made all of the plants spiked at once. The pleasure to be gained from this form is like that derived from repetition of a pattern in formal wallpapers or in certain fabrics. It makes an interesting contrast to the tree on which variations in color and shape are used. Our latest development is the most sophisticated – painting the driftwood a color that is related to the color of the bromeliads. The effect is that of a living mural. The combination of the live plants on wood shaped by nature, yet colored artificially is surprising and pleasing; and of course the color must be the right color. When we painted the wood the exact shade of rich, dark brown as that of the barring on Vriesia splendens, it was immediately evident that we had chosen the right color. Then we grew bolder and painted one tree a dusty rose to serve as a foil for the pink in the leaves of plants such as Nidularium kermesianum. The painting of the wood can also be a dulled background for the brighter foliage of the plants. Keep this kind of bromeliad tree away from other plants, say, in front of a monotone background. Form a plant pocket in the cement that holds the tree in the container. Affix the bromeliads tightly to the branch by forming a sphagnum moss ball about the roots, and then wiring on a ball of moss by winding the wire first around a small nail or tack, and then pulling portions of the moss from between the wires in order to hide the wires. Use a pinch of leaf mold with the moss, if you desire, but we have not found this to be necessary. Soak the moss occasionally with a dilute fertilizer when watering. Unless the plants are allowed to suffer from lack of water, you will not find it difficult to maintain the plants in good health on the trees. We have kept them happily installed for several plant generations. Pebbles may be used to hide the cement concrete anchoring of the tree in the container. As to kinds of trees, grapes, figs, driftwood, or such naturally smooth woods as manzanita are recommended. An easy way to apply water to the moss is to use a basting syringe that can be found in most super markets. 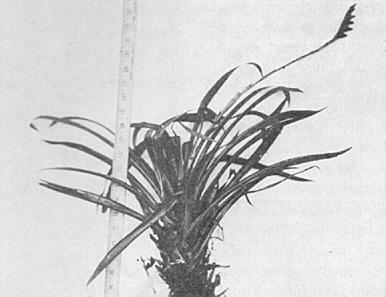 A very small bromeliad tree may be made with a height above the rim of the container of about eighteen inches, using only three plants, the largest being planted in the container. We gave up the "flag pole effect," that is, placing the driftwood straight up in the center of the container. Some of the most satisfying trees were arranged with an asymmetrical, bonsai, effect. We make no attempt to excavate plant pockets in the wood, for we found this unnecessary. After a while, many of the plants develop wire-like hold-fast roots that encircle the bare wood where they are probably better off than in a hole. 11973 San Vicente Blvd., Los Angeles 49, Calif. It is fairly common practice in wrapping plants to fold the leaves nearly parallel to the plant's axis, as in rolling into cylindrical form in a piece of corrugated board. This procedure may be satisfactory for soft-leaved plants, but is not to be recommended if the foliage is stiff and. particularly, if channeled, as creasing will almost inevitably occur at the leaf bases, resulting in disfigurement when the leaves grow out, and occasionally to loss of the plant months later because of rot which can start undetected at the damaged areas. Who has not had the experience of receiving a plant by mail, or otherwise, which, in spite of all care in potting and subsequent treatment, refuses to make any central growth but develops suckers instead? A possible cause of such behavior may be damage to the innermost growing tip of the plant from rough handling during preparation for shipment. Shippers might find it instructive to wrap plants by their usual methods, set the package aside for a week or so, then unwrap and plant and watch how the plants fare. 3122 N. Calvert St., Baltimore 18. Md. The emphasis on beauty found in this lovely species and in so many other bromeliads is reflected in this exquisite drypoint etching which won first prize at the Forty-second Annual Exhibition of the Chicago Society of Etchers, held in Chicago at the Findlay Galleries in the spring of 1953. The crisp, life-like appearance of the plant is enhanced by the size of the etching which is about life-size. The artist is the noted New Orleans etcher, (and our art editor), Morris Henry Hobbs. The Flaming Sword is the common name of Vriesia splendens because of its orange-red, flat spike. It is a plant of easy culture. A Cryptanthus and a Tillandsia are among its small companions on the branch. Ever since he collected this Portea in 1939, Mulford Foster has insisted that it is a new species. Consequently, I take pleasure in dedicating it to him in recognition of his untiring efforts. PORTEA FOSTERIANA L. B. Smith, sp. nov.
A. P. Silveirae Mez, cui affinis, inflorescentia cylindrica, bracteis primariis superioribus abrupte reductis et quam ramis valde brevioribus, pedicellis subduplo brevioribus differt. Flowering plant over 8 dm, high; leaves many, rosulate, nearly 1 meter long, covered on both sides with appressed cinereous brown-centered scales, the sheaths broadly elliptic, 20 cm. long, dark castaneous, the blades ligulate, sub-acute with a dark pungent mucro, 9 cm. wide, flat, subdensely serrate with straight antrorse dark spines 3 mm. long; scape erect, straight, 1 cm. in diameter; scape-bracts subfoliaceous, rather thin except for the stout pungent apex, serrulate, densely lepidote; inflorescence subdensely tripinnate, cylindric, 40 cm. long, 8 cm. 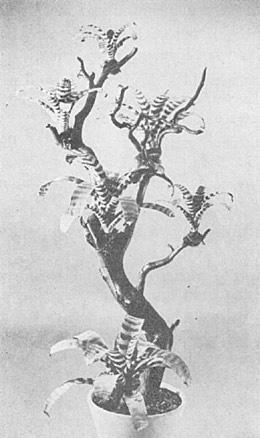 in diameter, persistently pale-lepidote; lower primary bracts like the scape-bracts, exceeding the branches, the upper abruptly reduced to small linear bodies that barely exceed the sterile bases of the branches, entire; branches spreading, few-flowered; floral bracts linear-subulate from a minute triangular base, shorter than the pedicels, free; pedicels to 6 mm. long, 1.5 mm. 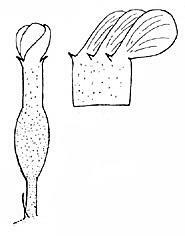 in diameter, terete; sepals very strongly asymmetric with the lateral wing far exceeding the terminal mucro, 15 mm. long, connate below in a cylindrical tube 6 mm. long; petals and stamens unknown; epigynous tube 3mm. deep; fruit ellipsoid, 10 mm. long. Brazil: Espirito Santo: In sun and sand, Santa Teresa, alt. 600 m., July 13, 1939, Mulford and Racine Foster 194-A (type in the Gray Herbarium of Harvard University). In my "Bromeliaceae of Brazil" I included Portea Fosteriana in P. Silveirae because of the permanently lepidote inflorescence that distinguishes them from the remainder of the genus. However, P. Fosteriana has a cylindrical inflorescence, upper primary bracts much shorter than the branches, and stout pedicels only 6 mm. long, while P. Silveirae has a slenderly pyramidal inflorescence, upper-primary bracts at least equaling the branches, and slender pedicels as much as 13mm. long. To the casual visitor, the vegetation of the West Indian island of Tobago seems to be little different from that of nearby Trinidad, from whose north-eastern promontory it is separated by 19 miles of sea. While Tobago's flora appears to be essentially continental in nature, my geologist friends tell me there is no geological evidence that the island was ever joined to Trinidad which is itself merely an interrupted extension of the Paria Peninsula of Venezuela. Because of its isolated position and small size, thus making for less physiographic diversification, fewer elements make up its flora as compared with Trinidad. My first visit to Tobago was for a two-week holiday in July, 1955. Because of my interest in bromeliads, I was anxious to see how the bromel flora compared with that of Trinidad. I was familiar with Broadway & Smith's "The Bromeliaceae of Trinidad and Tobago" (Proc. Amer. Acad. Arts & Sci., 68(5):152, 1933), and knew that 16 species had been reported from the island (compare with this about 53 native species for Trinidad and the Bocas islands). On landing at Crown Point airfield and motoring to Scarborough, I was struck by the virtual absence of bromeliads from the trees along our route. Coming from Trinidad, where the trees are thick with bromels and other epiphytes, this finding was quite surprising. True, the greater portion of western Tobago is low-lying and devoted to the cultivation of coconuts which in themselves are not conducive to epiphytic growth, but elsewhere along the coast, bromeliads were not common, even in fairly heavily forested areas. It is only when one climbs to the cocoa plantations with their assorted immortelles (Erythrina poeppigiana) or higher onto the Main Ridge that one encounters more abundant bromeliad growth. Even here, however, one doesn't find the richness of growth seen particularly in the cocoa-growing areas of eastern Trinidad. On Fort George hill rising behind Scarborough, there are a number of huge saman trees (Samanea saman) near the hospital. They support a heavy growth of a night-blooming cereus which I take to be Hylocereus Lemairei, but only one bromeliad, Gravisia aquilega, and only a few plants at that. In Trinidad these trees are covered with bromels, particularly Tillandsia utriculata, T. fasciculata, Aechmea nudicaulis and Gravisia aquilega as well as other epiphytes. The general paucity of bromels on samans was indeed noteworthy. At the Bacolet Guest House, a mile beyond Scarborough, dense growths of terrestrial Gravisia aquilega grow beneath the trees on the cliffs right down to the water's edge. I have noted in Trinidad that G. aquilega is a very adaptable plant, growing equally well in sunny exposures high in the trees or in dense shade on the ground, in areas of high rainfall (over 100 inches on the east coast) as well as under the xerophytic conditions of the Bocas islands (Chacachacare and Patos) which get less than 50 inches annually. Driving along the Windward Road to the eastern tip of Tobago, about the only bromels to be seen are a few Gravisia aquilega and Tillandsia utriculata. From Kings Bay the road climbs over Lambeau Hill before dropping down to Speyside and up again over Back Hill into Charlotteville. High on these slopes (at about 600 feet elevation) one runs into the striking-looking Aechmea dichlamydea. The great drooping inflorescences with their bright coral-red scapes may reach three to four feet in length. The laterally compressed 2½ inch long floral spikes have a somewhat varicolored appearance due to the lowermost floral bracts being tinged with green basally to white apically and the more distal ones shading into mauve apically. Petals are mauve with white tips. On completion of flowering, the spikes lose their mauve coloring, becoming essentially white, and with maturity the seed capsules turn blue. Also to be seen in this area are a few Aechmea nudicaulis. Around Charlotteville, the spirally-twisted plants of Tillandsia flexuosa grow on trees near the sea. Driving across the island from Scarborough to Plymouth one may see huge spiny plants of the terrestrial Bromelia karatas growing along the roadsides. The magenta-colored flowers of this bromeliad lie deep in the spiny heart of the leaf rosette which at anthesis turns scarlet. Inland on the way to Mason Hall one finds Tillandsia fasciculata and Aechmea nudicaulis on the ridges. Between Mason Hall and Moriah, the road drops down into the lush valley of the Courland river. Here may be found dense festoons of Spanish Moss or, as locally known, Old Man's Beard (Tillandsia usneoides), likewise prolific growths of Guzmania monostachia. At the time of our visit these lovely Guzmanias were in bloom and the countryside was "alight" with their bright red "candles." Also seen were the odd-looking little onion-bulb plants of Tillandsia bulbosa as well as Aechmea lingulata. Hohenbergia stellata and Vriesia splendens var. longibracteata also are known from this spot but I failed to find them although I know both species in Trinidad. In the cocoa-growing areas to the east of Mason Hall one again encounters dense growths of Aechmea dichlamydea on the immortelle trees. The typical form of this species does not occur in Trinidad, although we have the very beautiful variety trinitensis, described in 1933 by Dr. Lyman Smith. In 1957 we again returned to this lovely little island and on that occasion I had the opportunity of exploring a bit the slopes of the Main Ridge north of Roxborough, reaching the 5¼ milepost on the trace to Bloody Bay and Parlatuvier. The first few miles of this trace lead up through cocoa plantations freely planted with the shade-producing immortelles. In this zone are Aechmea dichlamydea, Tillandsia utriculata, T. bulbosa, Catopsis sessiliflora and C. floribunda. The finding of the latter constituted a new island record. Higher up (1,400 feet), in the Government Forest Reserve, Guzmania megastachya comes into view at about the 3½ milepost. This species is absent from the Trinidadian flora but it does occur in the Lesser Antilles to the north. In the field it closely resembles our Trinidadian Vriesia Splitgerberi with its erect green inflorescence of conspicuous primary bracts characteristic of the now defunct Thecophyllum. Also coming into view in this general area are Guzmania lingulata and Vriesia splendens var. longibracteata. In addition, seen but unobtainable, were two huge clumps of Araeococcus micranthus with long, narrow, serrated leaves and drooping dead inflorescences terminating in a multitude of root-like branchlets laden with blue currant-like fruits. High on the mountain two additional species of bromels were encountered which also proved to be new records for Tobago. These were Vriesia Broadwayi and Guzmania sanguinea. Both of these are interesting finds as the former was known only from the highest peaks of the Northern Range of Trinidad and in the case of sanguinea, another link is added in a strange distribution chain from Cocos Island off the west coast of Costa Rica through northern South America to Trinidad. 1, St. Andrew's Ave., Port-of-Spain, Trinidad, W. I. 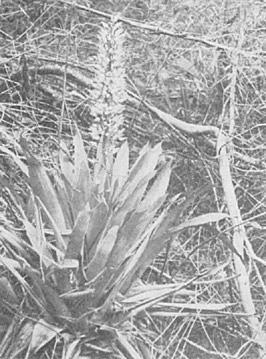 From "Bromeliads in Florida Horticulture"
A large number of terrestrial bromeliads are growing on or among rocks in their native haunts in Brazil, Peru, Chile, and elsewhere in the Americas. So, as introduced exotics, we have bromeliads in the genera of Dyckia, Hechtia, Encholirium, Bromelia, Neoglaziovia, Orthophytum, and Ananas which make excellent rock garden plants. These are gradually being introduced and propagated for the "new look" in rock gardens. A number of Dyckias have already been in cultivation and general distribution for a number of years, but there are many more, even more attractive, to be made known to the rock garden fancier. The other genera named are, unfortunately, very much less known but hold much interest for the courageous gardener who will risk something new. They not only have interesting and tough foliage, but brilliant spikes of flowers of endless variety and color. Two excellent rock garden bromeliads have proved to be in the genus Neoregelia, N. spectabilis (Painted Fingernail) and N. marmorata (Marble Plant) and hybrids of these. Their leaves become very red in full sun and their wire-like roots fasten themselves eagerly on the porous rocks of either coquina or limestone. The Neoregelias are more of an epiphytic type of bromeliad but they have adapted themselves so remarkably well in our own rock garden and others of central and south Florida that now we are recommending them as a colorful, novel addition to home-made rock gardens. Not to be forgotten are the Pitcairnias, a terrestrial leafy bromeliad which can be happy in the shaded garden either among rocks or near a pool. A number of the species remind one of tufts of grass, such as Pitcairnia flammea, until they produce their brilliant red tubular flowers on a branched spike which in some species continue to bloom for two months, such as P. corallina. 718 Magnolia Avenue, Orlando, Florida. A common characteristic of all bromeliads is their ability to form offsets, more or less numerous, depending upon the various species. These offsets differ according to the species in form as well as number, some often growing close to the mother plant smothering it with progressive development as in the case of many Vriesias. Others may grow upward and outward from the parent plant, trying to reach independence. Generally, in this case, the stem is more or less woody and bears at the end of the leaf funnel. The stem of the offshoot is usually bare, the roots forming at the place where the smallest leaves are. The desire of the offshoot to grow above the parent plant and away from it is most often seen in species whose old crown persists for a long time after flowering and fails to deteriorate in time to vacate the space needed for good development of young plants. Aechmeas, Billbergias, Quesnelias, Guzmania musaica, and others fall into this group. Some Cryptanthus species form young plants in the leaf axils. They push themselves off the mother plant when they have reached sufficient size, or they can be removed and will form roots after being planted. Sometimes these plants grow three or four tiers high and finally just break apart. The Vriesia group to which Vriesia splendens belongs differs in the formation of its offshoots. Here, one or two rosettes form close to the old inflorescence. With progressing growth the leaves of the old plant are pushed aside and deteriorate within a year. By this time the new plant is ready to flower. This quick development, observable also in seedlings, compensates somewhat for the small number of offsets. Vriesia jonghei or Vriesia regina develop numerous small plants close to the flowering stem, even before blooming. These can be removed and planted out. The old stem of the beautiful Neoregelia carolinae, fol. var. forms quite an additional number of young plants after the removal of the first offshoot. The old plant should not be discarded too soon. Offsets must not be removed too early but should be left on until some of the leaves are fully developed. Generally, they may be cut off if they show signs of root development. Roots may form in the soil or in the air with up-and-outward-growing species. It is best to let the offshoots remain on the parent plant as long as possible as they gain strength from the old plant. If removed too soon the offsets may grow very slowly or may die; it does not hurt the old plant to have the young ones left on for a long period of time. Sometimes, however, the removal of the first offset will encourage the formation of others. The removal of offsets is not difficult. Care should be taken when they are very close to the old plant. Have the knife very sharp. If the soft part of the plant is cut into, decay will invariably set in, and the offshoot is lost. Aechmea and Nidularium offsets should be cut below the newly formed small leaves at the woody parts. Offsets may be potted at once. Dust any cut, if bad, with charcoal, and let lay for a few days. New roots develop best in the smallest pots; planted too deep the offshoot may easily start to rot. Therefore the shoot should be planted shallow, although not so shallow that the shoot falls over or wobbles when rooted. A little practice will soon teach the best way to get them right. The potting material has to be very loose and drain well. It is not much different from the potting mixture generally used. Plenty of sphagnum, leaf mold that is not too decomposed, peat and sand are well suited as a good rooting mixture. It is absolutely necessary to pot tight. The bottom temperature, at least with the more delicate species, should be about 70° to 75°; during the warmer months a house with 68° to 70° temperature is enough. The leaf funnels should be watered at once after planting. The soil should not be kept too wet, but must be kept from drying out and thus has to be watched, as the loose soil does dry out rather quickly and once dry does not easily wet again. Too much water is no help in building roots–rather it hinders growth. Keep the young plants shaded, giving them more shade than mature plants. Species that like sun should be given more light as soon as roots are formed to avoid deformation of the leaves that get long, thin and narrow because of insufficient light. Usually, except for the very large growing species, offsets reach flowering size about a year after separation. If the shoot is weak, it will flower after the next growing period, i.e., again a year later. Vegetative propagation does not change the natural flowering time for the species. Offsets can be taken off any time, although late spring or early summer is generally preferred, as the nature-provided warmth can be used to advantage. A bromeliad was rather conspicuous in the colorful picture, page 281, of the February 1959 National Geographic Magazine. It is probably Guzmania plumieri growing on the rim of the volcanic crater, Pelée, (meaning bald), on the West Indies island of Martinique. The people of this tropical isle honor this volcano as a national monument. Bromeliads flourishing here is the basis for some interesting speculation. In 1902 this volcano erupted, an action which drained the lake in the original crater. Twenty-seven years later another eruption left a jagged dome above this crater. We wonder how long after these eruptions it took for the bromeliads to be established or re-established, in the event that they had been in that area before. Volcanoes seem to discourage plants or people for only a few years. Wherever the face of the earth is disturbed by volcanoes–fires, earthquake or flood–soon afterward some of Mother Nature's plants or people rehabilitate those areas–plants first, of course, then people. Seeds are always flying, carried by the winds or birds and the newly exposed surfaces become covered with plants that can adapt themselves to these new conditions. The amazing adaptability of bromeliads made this a possibility here on the heights of Mt. Pelée. According to Mr. Eiji Imura of Kyoto City, Japan, one of the Society's most enthusiastic members, the Bromeliad family has come of age for the layman in Japan just as in other countries throughout the world. 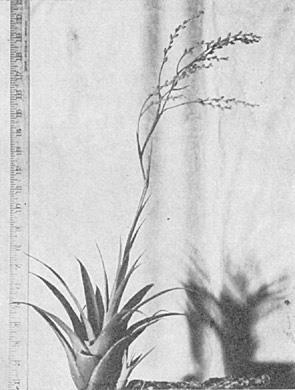 According to him, the first bromeliad introduced into Japan was the pineapple about 120 years ago. It was not until the 1930's that decorative bromeliads were introduced in any number, and these plants found their way exclusively into the botanical gardens and large private greenhouse collections. During World War II, many collections were depleted, if not entirely lost, but since 1955, many bromeliads have been imported by collectors and nurserymen, who have become so enthusiastic over them that bromeliads are now competing with orchids and other decorative foliage plants. As in the United States and Europe, foliage plants are used in Japan to decorate large stores and restaurants–nurserymen providing a "lending service" and maintaining the plants and then exchanging them for fresher ones when the original plants lose their luster. 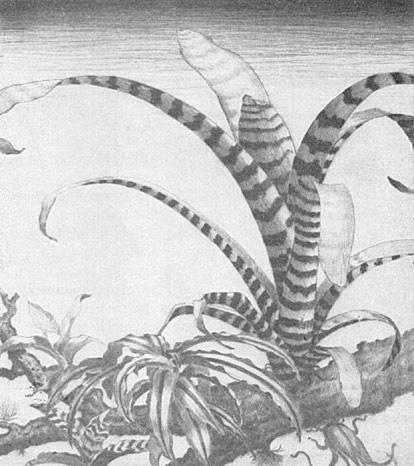 At the present time, according to Mr. Imura, the current vogue in bromeliads is the Billbergia nutans, B. pyramidalis, B. zebrina and B. macrocalyx. A few Aechmeas are also to be seen, as are Cryptanthus. These plants, he says, are used in tea parlors and dance halls in situations where more exacting plants would be difficult to maintain. Experiments are under way to grow Vriesias for the cut flower market. The Vriesia most used is V. carinata and some of its hybrids. Each flower sells for about 250 yen or 70 cents. Since the War, many private individuals and nurserymen have been importing bromeliads by the hundreds from Germany, the United States, and Brazil. Bromeliads may now be purchased in Japanese nurseries, according to Mr. Imura, and the most popular ones seem to be Neoregelia spectabilis, Billbergia nutans, Billbergia pyramidalis, Vriesia carinata, Aechmea fasciata, Aechmea weilbachii, Guzmania musaica. Mr. Imura is a commercial nurseryman. Although he says that his establishment is a small one, he hopes some day to make it a large one. His list of bromeliads is an imposing one–in fact, it contains many species rare to the United States, his list resembling one that might be found in Germany or Belgium because of the many fine European hybrids noted. His cultural methods are similar to those used in other parts of the world. He uses a soil mixture for Billbergias and pineapples, and sphagnum for the more epiphytic types. His bromeliads are fertilized at regular intervals. He grows his plants outside in summer and indoors in winter. 647 South Saltair Ave., Los Angeles 49, Calif. It is to be hoped that some time this year the Society will be able to have another membership roll printed. Members are continuing to join the Society in gratifying numbers, and we are proud to have members now in the Belgian Congo and South Africa. The enthusiasm that has been manifested in Australia and New Zealand is being equaled by bromeliad growers in Japan. The past year saw an increase of interest by those living in the West Indies, and we now have members in Cuba, Puerto Rico, the Dominican Republic, Haiti, the Virgin Islands, and Trinidad. If some of you feel a little isolated from the rest of the Society, consider the plight of these living in Australia. There, the members think nothing of driving 100 or 200 miles to see a fellow bromeliad enthusiast and to exchange ideas and plants. It is suggested that those of you in the remote areas might want to join the bromeliad Round Robin or start one of your own. ROUND ROBINS are a lot of fun besides being extremely helpful. If you would like to fly with the bromeliad robins, write to Mrs. Beryl Allen, 7006 Nebraska Avenue, Tampa 4. Florida. Visitors to Southern California should not fail to visit the Los Angeles State and County Arboretum, in Arcadia. The Southern California Bromeliad Society is very proud of its planting, and, thanks to Mr. Fritz Kubisch, the present president of the branch, the group has been able to plant many rare and interesting Tillandsias and other genera. The Society has a slide collection of sorts but would like to build up a bigger one so that we can make the collection available to members for use in programs or for study. If any members take kodachrome pictures of their plants, it would be deeply appreciated if they would take two of each subject, being so kind as to send the Secretary the extra slide. Our congratulations go to the members of the Florida West Coast branch of the Bromeliad Society who recently staged a very beautiful exhibit in connection with the Eleventh Annual International Orchid Show held by the local orchid society. Prizes were awarded for the outstanding bromeliads, Mrs. Karl Kaufhold winning the silver trophy for her Aechmea Maria regina. 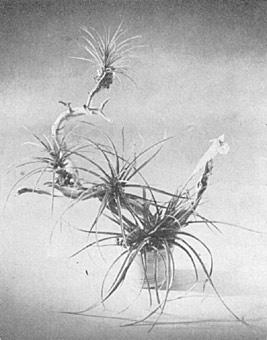 Other first awards were given to Mrs. Sydney W. Lawrence for her Billbergia amoena viridis; Mrs. C. S. Inman for her Cryptbergia meadii rosea, Tillandsia lindenii, and Neoregelia carolinae; Alberts & Merkel Bros. for their Guzmania lingulata; and to John Beckner for his Portea, Nidularium, and Vriesia species. On the other side of the world, in Johannesburg, South Africa, Mr. and Mrs. Les Bamford created a display that aroused a tremendous amount of public interest and was awarded the highest honor in the professional class, while in far-away Wanganui, New Zealand, Mr. A. Weber Todman, president of the Wanganui Cactus and Miniature Garden Society, arranged one of the first exhibits of bromeliads to be seen in that area, the occasion being the three-day "Floral Fete" during the annual conference of the New Zealand Parks and Reserves Superintendents in conjunction with the Royal New Zealand Institute of Horticulture. Mr. Todman writes that the display was viewed by more than seven thousand people, and that they were, at times, packed like sardines around it. We regret that limited space in this issue does not permit a more detailed description, with photos, of these and other very outstanding displays.